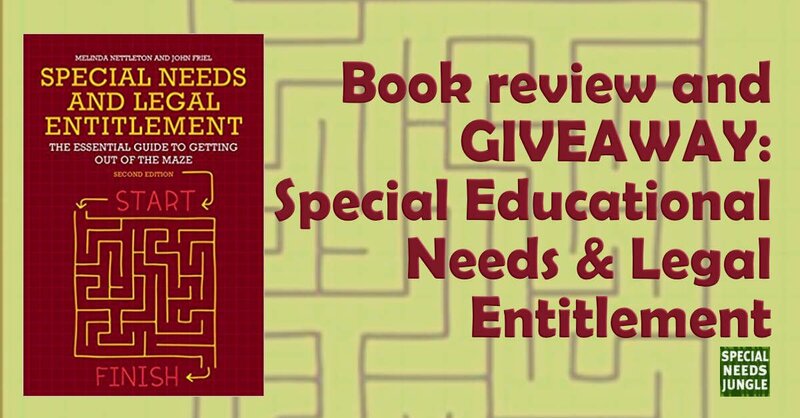 Today we have another review for you of an essential SEND Legal Handbook: Special Educational Needs and Legal Entitlement. 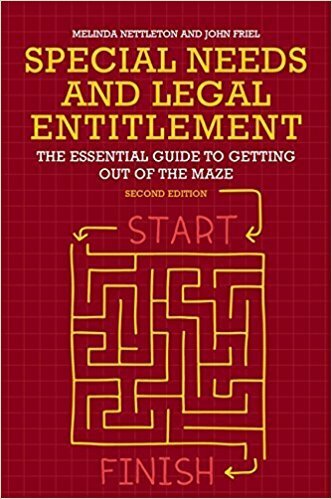 The essential guide to getting out of the maze. It's the second edition of this comprehensive guide to the SEND process by lawyers, Melinda Nettleton and John Friel, with a chapter by our columnist (and also SEN lawyer), Hayley Mason. Melinda Nettleton is the founding member and principal solicitor of law firm SEN Legal, She's also a Trustee of HACS (Hillingdon Autistic Care and Support). Melinda is the mother of three children, one of whom has special educational needs. She divides her time between London and Bury St Edmunds, UK. Her co-author is her husband, John Friel, who is a barrister at Hardwicke with expertise in public law issues. John has won leading cases in the House of Lords, Court of Appeal, and High Court, and is featured in The Legal 500 and Chambers UK as an Education Law specialist. Phew! The book is aimed at parents, professionals, and advisers to guide them through what has become an overcomplicated and confusing system. The authors provide you with a comparison of the previous system to the new current system. They explain how to apply for a statutory assessment for your child, how the code of practice works, how the system develops where parents are seeking to secure an Education, Health and Care Plan (EHCP), and how to appeal if required. The book does not cover the Equality Act rights in terms of disability discrimination in education, but it does refer to the Equality Act in terms of expert evidence. The book covers the updated definitive guide to the legal rights of children and young people with special educational needs. I really enjoyed the in-depth analysis within the chapter about the SEND code of practice. The authors explained how the code of practice works and where it is wrong when it comes to the law. For example, when the CoP discusses funding (paragraph 6.99), local authority top-up funding cannot lawfully override the requirement set out in section 42(2) of the Children and Families Act for children with an EHCP. This is a statutory duty to secure the special educational provision set out in the EHCP. The chapter about preparing a case and expert evidence is useful as the authors make it clear that appeals and mediation is evidence-based. Any dispute needs expert evidence. The book contains practice direction within the appendices, which demonstrates what the expert witness reports should contain. They emphasise that reports cannot be ‘stale’ and while parents may have an initial diagnosis report of autism, it will not define or explain the current need. The chapter about the 42 common problems will be very valuable to parents as it provides questions and answers to problems that they could encounter such as, ‘My local authority are saying no to an education needs assessment because the cost of the provision needed is under £6000’ or, ‘Our school says it cannot afford to provide the provision in our son’s Statement/EHC Plan’. Our columnist, Hayley Mason, who is also a lawyer at SEN Legal, has a chapter about deputyship, that she has also written about for us here on SNJ, although of course, the book will be in greater depth. We think this is another essential reference book for those entering or working within the SEN Jungle. Marguerite Haye joined us as a columnist toward the end of 2015. Marguerite is knowledgeable in the SEND legislation she embraces its ethos at the heart of everything she does, by adopting a child-centred approach to ensure every child receives the right provision. As a SEND teacher, Faculty Leader and Assistant Head Teacher in the education sector for over 15 years. Marguerite can recognise individual learning abilities and uses her initiative to tailor learning programs to meet individual need. Marguerite continues working with other agencies, schools and local authorities to promote and support their understanding and implementation of EHCP’s and SEND reforms efficiently. Through effective leadership, Marguerite promotes an appropriate culture, empowers staff and demonstrates high standards. Marguerite has built a connection with parents, young people and professionals alike in her career and this a huge asset to her current role as SEND advocate. Marguerite Haye joined us as a columnist toward the end of 2015. Marguerite is knowledgeable in the SEND legislation she embraces its ethos at the heart of everything she does, by adopting a child-centred approach to ensure every child receives the right provision. As a SEND teacher, Faculty Leader and Assistant Head Teacher in the education sector for over 15 years. Marguerite can recognise individual learning abilities and uses her initiative to tailor learning programs to meet individual need. Marguerite continues working with other agencies, schools and local authorities to promote and support their understanding and implementation of EHCP’s and SEND reforms efficiently. Through effective leadership, Marguerite promotes an appropriate culture, empowers staff and demonstrates high standards. Marguerite has built a connection with parents, young people and professionals alike in her career and this a huge asset to her current role as SEND advocate. I have this book and its fab.